These are the perfect autumn treat. Enjoy whilst looking at falling leaves and sipping coffee. NOTE: You can make these without the apple, if you so desire. Increase the pumpkin puree to 3/4 cup, and reduce flour to 2 1/4 -2 1/2 cups. 1. Heat puree, shortening, salt, and sugar in the microwave, or on the stove, stirring regularly until shortening melts. Set aside. 2. Whisk flax into creamer. Let sit a few minutes, then whisk again until thick. Set aside. 3. In a large bowl, mix together yeast and flour. Add pumpkin and flax mixtures, and the grated apple. Mix together into a rough dough, then gently knead until smooth, adding more flour as needed to make a nice soft dough that is tacky but not sticky. Remember that the apple will keep releasing water into the dough if you work it too hard. Also, a tacky dough makes for a chewy and tender donut. 4. Transfer dough to a lightly oiled bowl, cover, and let rise for 60-90 mins, until doubled in size. 5. Line a baking sheet with parchment paper. Spray with oil. 6. Roll out the dough on a lightly floured surface to 3/8" thick. Cut with a donut cutter, setting the donut holes aside. Dough scraps can be re-rolled and cut. Place on prepared baking sheet, spray with oil, and cover. Let rise for 1/2 hour. 7. Heat oil to 350 degrees. Fry donuts in batches (about 60 seconds per side) until golden, drain on paper towel or paper bags, then let cool on wire rack. Let fully cool before glazing. 8. Fry the donut holes and immediately toss in a cinnamon-sugar mix. Cool on a wire rack. 1. Heat the soy milk in a small saucepan over medium heat until bubbling. Whisk in icing sugar, then vanilla and spices. Turn off heat, but keep the pan on the stove. 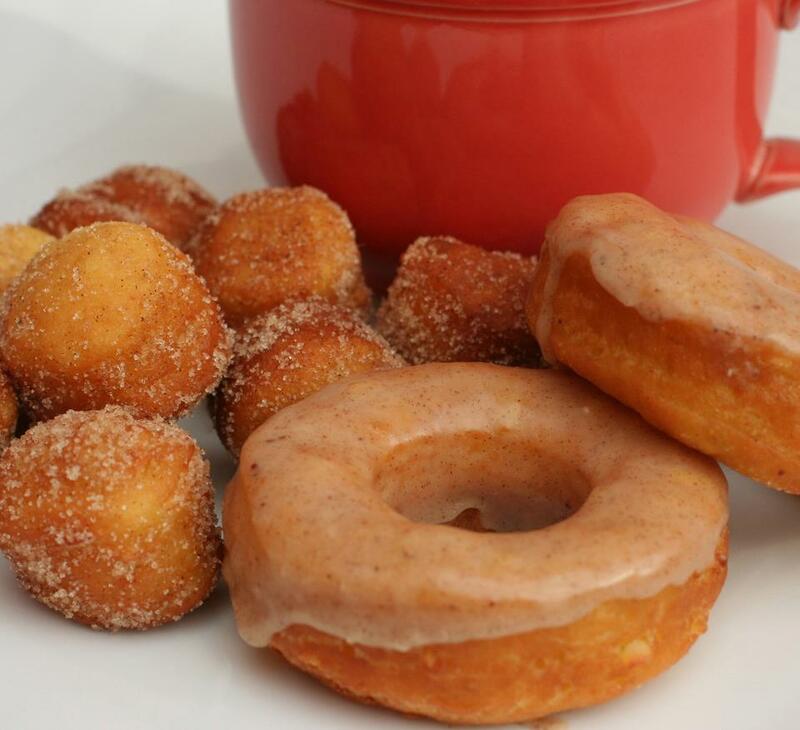 Dip in donuts and let cool. NOTE: These freeze very well, glaze and all.